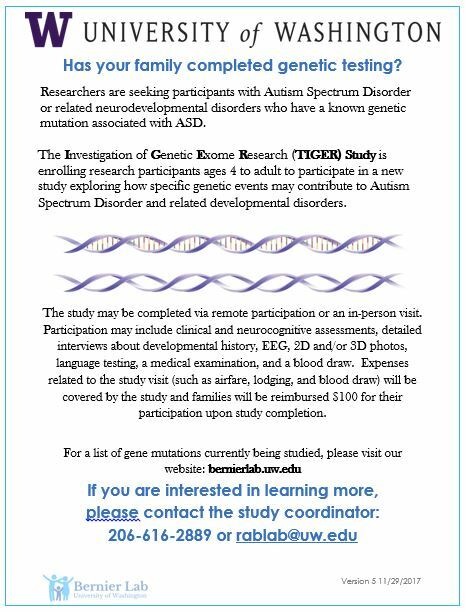 In the TIGER research study, we are learning more about individuals with genetic events associated with autism spectrum disorder (ASD), intellectual disability (ID), and/or developmental delay (DD) in order to better describe how different gene disruptions impact behavior in children and adults. Individuals with these genetic changes may have neurodevelopmental differences that we would like to better understand. Families who participate in the TIGER study will be able to help us further scientific knowledge of these rare genetic events through either remote participation or an in-person visit. Participation will include clinical phone interviews, questionnaires, photos, and a blood draw. For in-person visits, we may also complete neurocognitive assessments, EEG, 3-dimensional photos, language testing, a medical examination, and optional skin biopsy. Expenses related to the study visit (such as the blood draw or lodging) will be covered by the study and subjects will be reimbursed $100 for their participation. Please see below for a list of genes that we are currently studying in the TIGER study. This list is not comprehensive. The field of genetics is always advancing and additional genes might be added to the list in the future. If you’re interested in participating and your child has a gene event not on this list, please feel free to contact us to check!